On Monday, June 20th 2016 H.E. Ambassador of France in Belgrade Christine Moro handed over the Order of Academic Palm in the Rank of Knight on behalf of the French Ministry of Education and Culture to Pavle Kovačević, a professor on the Faculty of Medicine of the University of Novi Sad, and to Bratislav Krstić, a director of the Pirot Grammar School. 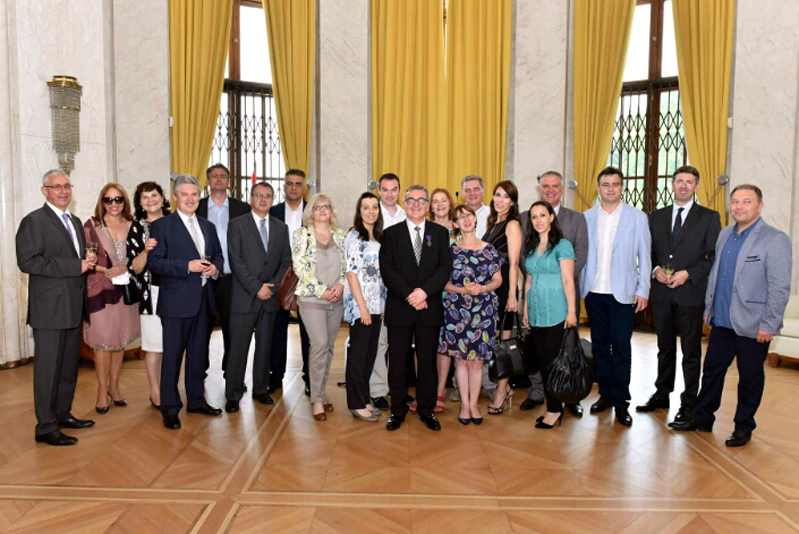 At the award ceremony which took place in the Embassy of France in Belgrade, Ms Moro pointed out that the Order was presented to outstanding individuals who, within their own fields, had contributed to the strengthening of bonds between Serbia and France. The metier of both receivers is tightly connected with and professionally oriented towards France, which are the grounds for this decision. In this moment the first generation of the Pirot Grammar School attending the francophone bilingual class are at the end of their secondary education. Hence, H.E. Ambassador Moro extended her gratitude to director Krstić for taking part in this programme by teaching geography in French. This class was formed in 2012 and children have been enrolling for this profile ever since. Director Bratislav Krstić extended his gratitude for the honour bestowed on him, pointing out that “to be a knight is a great honour indeed, as well as the responsibility and duty to continue along the path of popularising the French language and culture. I need to express how happy, proud, flattered and excited I am to be among the knights of the Academic Order, among all those who belong to that big humanistic and cultural community”, Krstić pointed out. The Order was established more than 200 years ago and it is presented to the French and foreigners alike for their scientific and professional efforts, as well as for their contribution to the strengthening of the reputation of France in the world. The founder of this Order was Napoleon Bonaparte, who had established it as a recognition intended for eminent members of the University of Paris. Since 1866 it has been presented to foreign citizens as well. Since 1955 the Order of Academic Palm comprises three ranks: a knight, officer and commander.